High-integrity pressure protection system (HIPPS) can be defined as a type of safety instrumented system specifically designed to work with high pressure applications and prevent over-pressurization of a plant, such as a chemical plant or oil refinery. This system cuts down the source of high pressure and shuts down the entire function before the design pressure of the system is exceeded, thus preventing loss of containment through the rupture (explosion) of a line or vessel. Globally, increasing high pressure work application and strict safety guidelines for the industrial applications is expected to be one of the key growth drivers of HIPPS during the period of study. Geographically, North America dominated the high integrity pressure protection system market driven by higher demand and consumption by its robust oil & gas and power generation industries in the region. North America was followed by Asia-Pacific and Europe as second and third largest market for the high integrity pressure protection system market. Asia Pacific is projected to have the fastest growth, owing to rapidly increasing industrial and machine safety emphasis by the organizations and influence of multinational companies in adoption of safety systems. This report identifies the high integrity pressure protection system market size for the years 2014-2016, and forecast of the same till the year 2022. 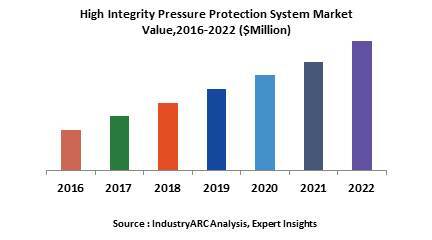 It also highlights the market drivers, restraints, growth indicators, challenges, and other key aspects with respect to the high integrity pressure protection system market.